Although innocent bystanders in the 2008 financial crisis, the life insurance companies were most impacted by the knock-on effects of the fall in equity prices, declines in long-term interest rates, poor credit quality of debt and a general decline in economic activity. As Table 1 demonstrates, the industry remains permanently ( i.e. long lastingly) impaired. Share prices of the major lifecos are, largely, below pre-2008 levels and/or have not participated in the upswing of equity prices enjoyed by other financial institutions. 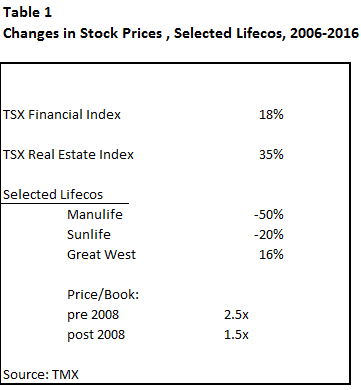 Major lifecos, such as Manulife and Sunlife, remain well below levels of a decade ago. 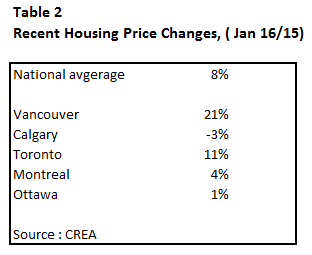 More importantly, prior to the 2008 crisis, the industry commanded price-to-book values of 2.5 times, only to see that metric drop down to 1.5 times today. The industry continues to face a challenge of repairing balance sheets and of tailoring their products to reflect the changes in today`s economic environment. Above all else, the lifecos have suffered at the hands of today's low-interest rate world. They are in a constant struggle to match the return on assets to the requirements of future liabilities. Re-investing fixed income assets at successively lower rates, in effect, increases the risk of long-term liabilities. In particular, the liabilities most at risk are annuities and guaranteed income products. Low rates also affect reserves and capital margins, necessitating capital infusions to meet industry regulations. Although the bulk of the industry`s assets are in fixed income, the industry was compelled to seek greater returns from equities and other asset classes-- the familiar "stretch for yield". Many of these other assets groups failed to provide the needed additional returns to offset the declining returns from bonds. For example, Manulife assumed a higher risk profile from the purchase of equities, specifically in the oil and gas sector; the slump in energy prices has hurt profitability. Any mismatch between assets and liabilities leads to profit volatility, a state of affairs that continues to exist. premiums will rise, at the risk of losing potential customers. products, such as mutual funds, universal life policies and managed accounts. The growth of this segment is reflecting the maturity of the baby boomers and their needs for retirement income. Finally, given that the domestic market is quite mature, if not saturated, the majors are looking at markets internationally, especially in Asia. There has been no end of warnings by domestic and international organizations that the Canadian housing market is primed for a major fall, a correction that many consider long overdue. The Canadian Mortgage and Housing Corporation ( a crown corporation) cites the " problematic overvaluation conditions in local markets". The OECD claims that the Canadian market is anywhere from 30-50% overvalued. It is not our intention to get into this debate directly. Rather, we want to point out a number of mitigating conditions that will operate to cushion, if not actually prevent, any major decline in house prices. From the borrowers' perspective, one of the most often cited metrics is that which measures the level of household debt to household incomes. There is no magic ratio that will automatically trigger a significant market decline. No one can answer the question: how high is too high? 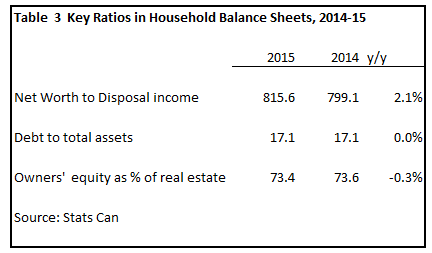 What is more relevant is the nature of the household sector's balance sheet. Table 3 sets out some basic parameters by which to judge the vulnerability of the housing market from the perspective of household wealth. In the past 12 months, households' net worth to disposable income has increased by more than 2%. At the same time, debt-to-assets remain constant at a very low level of 17%. And, most importantly, owner's equity in their homes remains constant at 73%, indicating that homeowners have amassed a considerable amount of equity. Hence, there is an adequate buffer within the household sector, providing stability in the housing market. upping the insurance premiums on mortgages with less than 10% down payment. The commercial banks dominate the mortgage market, capturing over 80% of all mortgages issued. These lenders' have been relatively conservative in their management of their mortgage portfolio. 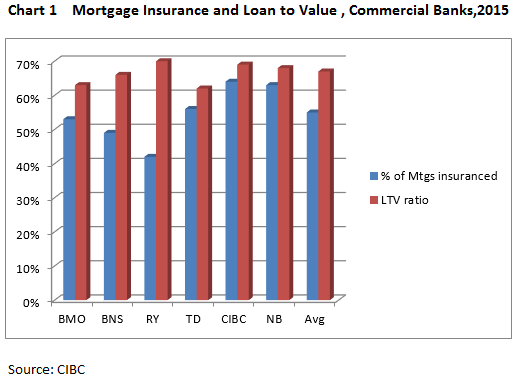 On average, the major banks have issued mortgages with an LTV between 65-70%, and , in addition, 50-60% of all mortgages are insured (Chart 1). For the industry as a whole, 3% of its total loan portfolio is in uninsured real estate in Alberta. In sum, there is a considerable buffer created by the banks and the insurers in the event of a sharp decline in housing prices. Both borrowers and lenders are reasonably able to maintain stability in the Canadian market. The Canadian financial institutions have weathered the storm of the 2008 crisis, yet many challenges lie ahead. Investment dealers are struggling with changes due to technological innovation, government regulations, and a seriously weakened natural resource sector. The commercial banks are challenged by persistently low interest rates and the current weakness in the energy sector and its spillover into the national economy. The lifecos are looking at new strategies to ease the task of matching assets and long-term liabilities in an effort to stabilize profits.